Hike Barbados takes you through cane fields, gullies, tropical forests and coastal communities to explore the unique geological and social structure of Barbados. Along the way you will meet new friends, enjoy healthy exercise, and observe the delicate balance of the unique heritage and environment of Barbados. All morning hikes (multiple groups) start at 6:00 a.m. Afternoon hikes (medium pace only) start at 3:30 p.m. except the moonlight hikes which start at 5:30 p.m.. You are advised to bring a torch to the moonlight hikes. There is a morning hike and, in addition, either an afternoon hike or a moonlight walk on every Sunday EXCEPT the date of the Great Train Hike. The morning hikes are broken down into the following groups. The afternoon and moonlights are one group only at medium pace. All hikes last approximately 3 hours. Loose clothing, comfortable hiking boots/sports shoes, sunscreen, hat. Bring your camera and a bottle of water. Join ShívS on their hiking adventure along the East Coast of Barbados. Relax and learn a little Barbados history while enjoying untouched nature. Walk along secluded beaches and hike the lush countryside as you enjoy rustic charm and the local character of Barbados with a stay at Santosha. Located along the old train line trail, Atlantis Hotel is an elegant base for a hiking holiday on the scenic east coast of the island. Located on the windswept southern tip of Barbados Ocean Spray Beach Apartments offers an authentic island escape and an opportunity to hike this beautiful coastline. See why Fodor's Travel selected hiking as one of their 25 Ultimate Things to Do in Barbados! 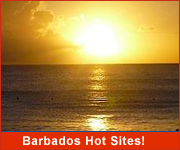 Click here for Barbados Hiking Holidays!